* 1900 - Merged into the Atlantic Coast Line Railroad. + 1870 - Re-organized as the Wilmington & Carolina Railroad, which was quickly renamed to the Wilmington, Columbia & Augusta Railroad. The Wilmington & Manchester Railroad was chartered in 1846 in South Carolina and 1847 in North Carolina, and opened in 1854 from Wilmington west to Camden Crossing, SC on the South Carolina Railroad's branch to Camden - a total of 161-1/2 miles. It was not successful and was sold under foreclosure for the first time in 1857. During the U.S. Civil War, the railroad suffered from the destruction of its track and equipment and from the inability to acquire the necessary materials for repair and reconstruction. When the war ended, the earnings were so small that it was impossible to put the road in proper condition. Legal proceedings began and a second suit of foreclosure was brought to the courts of North Carolina and South Carolina. The company was consequently sold on January 5, 1870 and re-organized as the Wilmington & Carolina railroad, which was quickly renamed to the Wilmington, Columbia & Augusta Railroad, opening an extension west to Columbia, SC in 1873, but never reaching Augusta, GA. 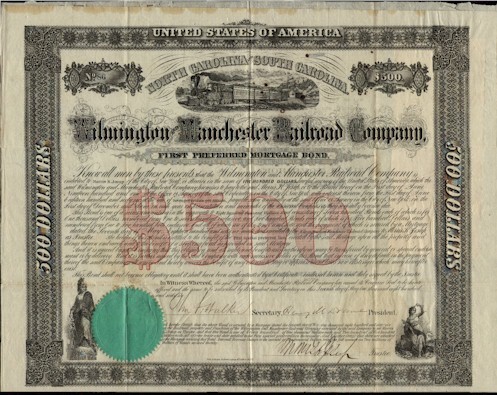 In 1878, the Wilmington, Columbia & Augusta Railroad entered bankruptcy, and its lease of the Wilmington & Manchester Railroad was terminated. The Wilmington & Manchester Railroad rose again and struggled along until it was acquired by the Atlantic Coast Line in 1900. The last passenger trains ran on this line in 1967. The section from Pee Dee to Mullins was abandoned by Seaboard System in the mid-1980s. The section from Marion to Mullins was operated by the Marion County Railroad for a period of time, but this section has apparently been abandoned now also, although the tracks remain in place to the outskirts of Marion. CSX Transportation, Inc. abandoned the section from Sumter to Florence in three phases. The section from Timmonsville to Lynchburg (9.05 miles) was abandoned around 1987. The section from Florence to Timmonsville (9.21 miles) was abandoned in 1989. The section from just northeast of Sumter to Lynchburg was abandoned by 1992. This section of railroad was always fairly well used up until the time it was abandoned. .
CSX still operates the line from Florence to Pee Dee as part of its A-Line. The Carolina Southern Railroad operates the former CSX trackage east of Mullins, SC to Whiteville, NC. Founded in 1850, the town of Florence, SC was the vision of entrepreneurs and was built around the opportunities of the Wilmington & Manchester Railroad. General William W. Harlee (1812-1897) constructed the first rail lines here, and in his honor, the town was named after his daughter. From the Charleston, S.C. News June 25 - The passengers of the Northwestern Railroad yesterday confirmed the report of the accident on the Wilmington and Manchester Railroad, and bring further particulars. We learn that the accident occurred at Soldier's Creek, about thirty miles from Wilmington, at 5 A.M. Sunday morning. The heavy rains had caused the creek to rise, and the trestle was undermined, the embankment being washed away. This was not known to the engineer, and as the down train struck the trestle it gave way, and the engine and baggage and mail cars were precipitated into the creek. The engineer leaped from the engine and saved himself, but Mr. Jackson Harral, a trestle builder, and Mr. C.J. Bird, a section master, were caught in the wreck and instantly killed. The engine went headforemost into the creek, but gained the opposite side, and stopped in a perpendicular position, with the smoke-stack and cow-catcher out of the water. The fall of the engine carried with it the baggage and mail cars; these were broken into fragments, and the mail agent was saved only by a miracle. Most of the mail matter was lost, and that saved from the wreck was too wet for distribution, and was carried back to Wilmington. Fortunately, the passenger cars were stopped when they were almost on the verge of the chasm, and the passengers escaped with a rough jolting and a few petty bruises. In consequence of this accident, we have been without a Northern mail since Saturday, but understand that repairs have been already commenced, and it is anticipated that the travel will soon be resumed along the road.